Every Sunday evening at 7 p.m., Hendricks Chapel comes alive. Members of the Syracuse University community come together for the Dean’s Convocation, a spirited gathering featuring music and reflection. The idea of a weekly convocation emerged from the Syracuse campus community and was instituted by the Rev. Brian Konkol, the new dean of Hendricks Chapel, at the beginning of the fall semester. The convocation is intended to be a weekly gathering place for all people that features a diversity of religious, spiritual and philosophical perspectives. Each convocation features congregational singing, led by University Organist Anne Laver; at least one choral anthem featuring the Hendricks Chapel Choir, led by Director Peppie Calvar; and a guest artist. The convocation’s artistic elements combine with a reading and message based on the week’s theme, delivered by Konkol or an invited guest. This semester, Konkol has spoken on the themes of beginnings, belonging, purpose and finding joy in the midst of struggle. Hendricks chaplains and staff—who represent a diversity of traditions—have reflected on the themes of inclusion, strength, unity and service. This Sunday’s convocation will focus on the theme of memories, and will lead into a candlelight vigil hosted by the Syracuse University Remembrance Scholars to begin the University’s annual Remembrance Week. The Dean’s Convocation has quickly taken root in the University community. The first gathering took place on the last Sunday of August and was attended by 40 people. A recent gathering was attended by nearly 300. Those gathered include students, staff, faculty and community members from across the religious, spiritual and philosophical continuum. “The convocation celebrates our commonalities and also acknowledges our differences. As a Christian, I believe it all shows that people can both develop strong personal beliefs and also grow in a deep commitment to grace and hospitality,” Konkol says. “Also, as ‘a home for all faiths and a place for all people,’” the chapel—and the purpose which guides it—serves as a distinctive and significant reminder that our collective future depends upon whether or not people that navigate life differently can strive for a common good,” Konkol says. 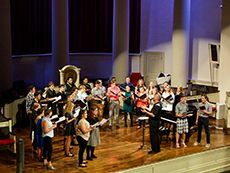 As an ongoing collaboration between Hendricks Chapel and the College of Visual and Performing Arts (Calvar and Laver are both VPA faculty members), the Dean’s Convocation also gives audiences opportunities to hear student and faculty performers and ensembles from the Setnor School of Music on a weekly basis. Konkol’s hope is that each week, those who attend Dean’s Convocation carry its impact with them as they depart through the chapel doors and head into a new week. “My hope is that every person who attends experiences something beautiful and leaves with the understanding that we need each other to become ourselves,” he says. For details about the weekly Hendricks Chapel Dean’s Convocation, call 315.443.2901 or visit hendricks.syr.edu.